Develop knowledge and skills to address today’s most pressing global challenges. Our world is more integrated and interconnected than ever before. At the same time, persistent tensions and conflicts continue to arise within and between our societies. To be an engaged, global citizen today, an understanding of the diverse institutions and cultures that define these societies is critical, along with strategies for building fruitful relationships among them. Develop a global perspective that understands economics, political science, and culture, and includes concentrated coursework in your area of interest. Build competency in a foreign language and culture of your choosing. Understand the important and complex human, social, political, and economic issues at work in international affairs today. Think critically about globally oriented careers, including those in government, international public policy, non-governmental organizations, and international business. Denis McDonough teaches undergraduate students in the Keough School’s global policy seminar. The Keough School undergraduate major in global affairs is an interdisciplinary and integrated study of contemporary global issues, grounded in a human-centered approach. This approach demands that future policymakers consider those affected by the world’s most daunting challenges first. Our program is designed to enhance and add breadth to work in your primary major at Notre Dame. It offers you the opportunity to overlay a global, disciplinary way of thinking to your primary studies in business, engineering, science, architecture, or arts & letters. You must complete the credit requirements of your primary major, in addition to the requirements of the global affairs major at the Keough School. Develop foundational skills and an integrated mindset for a global career. *For the global cultures and global politics course requirements, you will select from a list of courses offered in different departments across campus as well as in the Keough School; approved courses are listed each semester under Course Attribute GLBC (global cultures) and GLBP (global politics). Select five courses* in a concentration of your choosing. 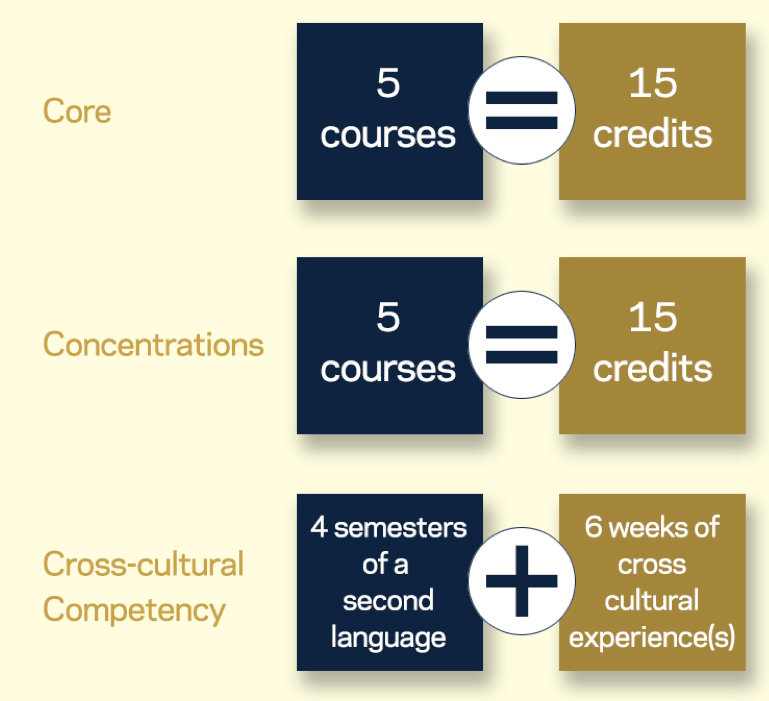 *To complete your concentration course requirements, you will select from a list of courses offered by the Keough School, its global institutes, and other colleges and schools across the Notre Dame campus; approved courses are listed each semester under their respective Subject Codes (shown above). All students are required to attain a proficiency in a second language and participate in an immersive cross-cultural experience. You will work with a Keough School advisor to plan and complete these two cross-cultural requirements. Many courses in the global affairs major can also fulfill university and college requirements. Contact the Keough School Academic Advisor for further guidance and information. What can you do with a degree in global affairs? Questions? Ready for the next step?